Our kitchen drawers and cupboards are equipped with pots and pans of all shapes and sizes. But do we actually need ten different pans, casserole dishes, and roasting tins when one bit of kit could do? Well, a multi-cooker may convince you that the answer is no. If this multipurpose appliance can pressure cook, bake, steam, roast, fry, saute and simmer, then it may be worth getting one and doing away with all the clutter in your kitchen. Our best multi cooker reviews will help you find the best one for your needs. While all our picks for multi-purpose cookers can do a variety of things depending on the cooking function you select, each one tends to be stronger in a particular area, be it frying, pressure cooking, slow cooking or making rice. Therefore, it may be wise that you anticipate beforehand what you’ll use this appliance for the most. Want to only do slow cooking? If you know what to look for in a slow cooker, you can get a very good inexpensive one. On the other hand, if you prefer finishing your cooking in quick time with the least amount of interference on your part, then an electric pressure cooker is what you want. But first, you should understand what a multi-cooker actually is, how to tell if it is something that’ll be a good investment, and how to pick the right one for your needs. What is a Multi Cooker and What Can You Cook in it? Do You Really Need a Multicooker? Slow cooking has been making a comeback for a while now because not only is it a great way to limit the need for constant supervision when cooking, but it can also make a tough and inexpensive cut of meat very tender. A slow cooker is an energy efficient appliance too. However, it is also a space guzzler and it can only do one thing. In this day and age no one has the time to plan and slow cook every single meal. Sometimes, you have to come up with a dish for dinner with just about an hour to go. That’s where a pressure cooker – stovetop or countertop can be a blessing. Stovetop pressure cookers can cook foods more quickly than normal cooking does, but they do require some knowledge on your part of how this type of cooking works and you have to time the process yourself. An electric pressure cooker takes the guesswork away as it usually comes with preset levels of pressure and time needed for various foods. Both can cook foods up to 70% faster than normal cooking. Keep in mind that you should take into account the time needed to bring the cooker to the desired pressure level before cooking actually starts and the time needed to gradually release the pressure in the end before you can open the cooker. Some models come with quick release valves to reduce this time. But wouldn’t a pressure cooker slow cooker combo be great so that you could combine slow cooking and pressure cooking into one appliance to save kitchen space? Many types of multi-cookers can do just that as well as add other cooking methods, like sauteing, steaming, baking and more to make everything from soups and stews to rice, stir fries, cakes and even yogurt. You can start by adding a few ingredients to the inner cooking pot and begin with one cooking method such as searing of meat and then add some more ingredients along with water, seal the pot and start pressure cooking. When the whole process is done, you can have a great stew with the right texture and flavor of meat in just a short amount of time. Some multi-cookers leave out pressure cooking but excel at some other function like air frying, where you can make deep fried foods like french fries and chicken without adding much oil. Another popular function is rice cooking. Both brown and white rice can turn out very well in a multi-cooker and doesn’t require you to use the boiling method where you have to strain the rice in the end. Because a multi cooker is electric, it can be programmed to cook a multitude of foods and turn them out perfectly. Pressure, temperature and time can either be automatically set depending on a preset that you select, or they can be manually controlled if you prefer. The former can drastically reduce the time and effort you have to put in beyond the initial steps where you add ingredients and optionally stir them before closing the cooker. Some types of cookers may come with an automatic stirrer, especially if air frying is an important function. You don’t want to constantly monitor your stovetop pressure cooker for whistles and decide when to turn off the stove. An electric multi-cooker will do this automatically for you. You want multiple safety mechanisms built into the cooker so that operation is completely safe and you’re forced to eliminate any possible operation error. You don’t have a natural flair for cooking and need to take the guesswork out of following recipes the traditional way. A multi-cooker has so many built-in functions, that you only need to follow some recipes to know what ingredients to add. After that you can just select an appropriate function and leave it. Want to experiment more with different methods of cooking to make more types of dishes than you would normally try with your limited number of pots and pans. If you don’t want to turn on the gas oven to bake a cake but don’t have a countertop oven, or if you want to make natural homemade yogurt, or make a full flavored soup from scratch, you can do all this and more with relative ease. You have a busy life and want to prepare a pot for dinner before leaving for work in the morning but have it ready and hot in time for you and your family to enjoy a home cooked meal. The delayed timer and Keep warm function can help you achieve this. You want to conserve energy and reduce electricity bills, as the time it takes to cook a dish is much faster, thereby taking up much less power than a toaster oven, microwave or rice cooker. You want to do one pot cooking to reduce the number of utensils needed to be cleaned. You can start and end a dish using just a multi-cooker. You don’t have the patience to learn how to use it. The learning curve in the beginning can be steep, as there are lots of programs and settings to figure out. You will also need to follow recipes in the beginning, at least until you feel comfortable enough to experiment on your own or until you know how to make a particular dish from experience. You don’t have the budget for it. Even if you can afford one of the cheaper multi-cookers, you may need to also get a spare inner cooking pot if you don’t want to use the cooker for multiple dishes in the same day. Or you’d have to empty out the pot after the first dish, wash and then use it again for the second dish. You may also want a spare lid if the model doesn’t come with one because it can be useful if you want to store leftovers in the inner pot itself in the fridge. A glass lid would also be useful if you want to see inside the pot while doing any non-pressurized cooking. Maybe an extra pressure gasket to use for mild smelling dishes so that strong smells from the previous dish doesn’t get transferred. All these extra purchases can add up to a lot right away. The most popular choice among multi-cookers is a mid-range model from a brand that is instantly recognizable and has earned itself a legion of fans. The Instant Pot DUO80 7 in 1 cooker can do almost everything possible. This particular size is an 8 quart appliance that features an easy to use control panel with 14 pre-programmed cooking functions, from Soup, Meat/Stew, Bean/Chili and Poultry, to Rice, Multigrain, Porridge and Yogurt, to Sauté/Simmer, Steam, Slow Cook, Pressure Cook, Keep Warm, and Manual. You can save up to 70% cooking time with just this one appliance. The microprocessor on this multi-cooker uses the latest 3rd gen technology to monitor temperature and pressure and automatically adjusts the cooking time and heating intensity to cook a dish perfectly and consistently according to your selection everytime. When you use the pressure cooker function, you can choose between a high pressure and a low pressure depending on what you’re cooking and how fast you want the dish done. For example, tough cuts of meat would do well in the high pressure setting, while delicate foods can be cooked using low pressure. This function will operate for up to 4 hours. If you select the saute or slow cook functions you can also choose between three different temperature settings for complete control over your dish. You can also use this cooker for boiling-water canning. You can delay the start of cooking for up to 24 hours and the keep warm function ensures that you will have a hot meal when you’re ready to eat. The inner cooking pot, lid and steam rack are all food grade 304 (18/8) stainless steel, so you don’t have to worry about the possibility of chemicals leaching into the food, and they’re all dishwasher-safe. The bottom of the cooking pot is three-ply for even heat distribution and cooking and there are level markings on the inside to help you gauge how far you can safely fill the pot for pressure cooking. In addition to the steam rack, other accessories include a rice paddle, a soup spoon, a measuring cup, a condensation collector and a recipe booklet. The steam rack comes with handles to make it easy to lift out of the hot cooker. Other good design elements include a lid holder for left or right handed people, a brushed stainless steel exterior that repels fingerprints, near noiseless operation, and no leaking of steam. You don’t have to solely rely on the recipe booklet to cook. You will also have access to Alexa skills and a free app to try over 300 recipes. This cooker is UL and ULC certified and includes 10 safety mechanisms to eliminate accidents that could otherwise happen due to operating errors. To eliminate the hassle of transferring cooked food from the cooker’s pot so that you can prepare the next dish, you can buy multiple IP inner pots separately. You can also buy lids for them so that each dish can be stored in the fridge while you use another cooking pot in the cooker. If 8 quart is too big for you, try the 6 or 3 quart model. The 6 quart Instant Pot IP-DUO60 is one of our top picks for an electric pressure cooker, so you can read that full review here. While the Instant Pot is more popular, the Breville The Fast Slow Pro is fancier and more expensive and it is the best all in one multi cooker that money can buy. This 6 quart cooker trumpets its pressure cooking and slow cooking abilities but it can also steam, reduce, saute and sear in minutes while retaining maximum amount of nutrients in the food. Where this unit really shines is its digital LCD display, which is lacking in all the other cookers. Let’s be honest; there is a steep learning curve if you’re new to multicookers and the only real way to get comfortable with all the presets and controls is to try out recipes. There is usually no display to tell you what’s going on beyond the current cook time and pressure setting. With the Breville Fast Slow Pro, the display tells you when it’s building pressure, cooking and releasing steam by changing color. Also, every selection you make you can see on the menu, making the operation more intuitive. There are 11 pressure cook settings plus a customizable setting for those who like more of a hands on approach. You can slow cook for 2 to 12 hours on the High or Low settings. If you want to keep the fully cooked food warm until you’re ready to eat, there’s a Keep Warm function. Both the pressure and the slow cook functions use automatic time, temperature and pressure adjustments between fast and slow cooking. This happens via the dual sensors at the top and bottom that monitor the ingredients for more accurate control. The steam release happens automatically according to the inside pressure and cooking function to maximize flavor and texture. It can happen quickly and continuously to prevent overcooking, or it can happen in bursts to minimize food disturbance, or it can be released naturally and not through the vent. This is one of 3 safety mechanisms employed, the other two being the safety locking lid and the safety valve. The cooking bowl is aluminum with PTFE/PFOA free ceramic coating and the hinged lid can be operated one handed. You also get a stainless steel steam basket and a stainless steal steam rack to hold the basket or any food that you want to raise over the water level inside. The cooker is easy to clean and steam leaks are managed by the wide moat around the rim. The one common complaint from users is that the display often shows the error, “lid not sealed” for pressure cooking. This is likely the result of the pressure relief valve on the top of the lid not being properly aligned and NOT the safety locking pin for the lid. This is shown in the manual directions. Some users say that the pot and gasket retain some of the smells from the last meal cooked. The Sear function is not its strongest point on account that the ceramic coating doesn’t allow the bottom of the pot to reach a very high temperature. However, all the other cooking methods work very well, including sauteing. The Instant Pot is not the only multi-cooker of its kind. 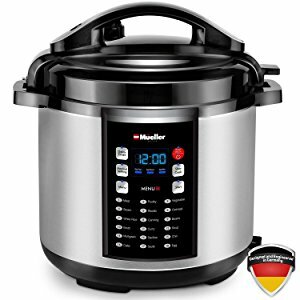 There are a few direct competitors and the Mueller 10-in-1 Pro Series 18 Program 6Q Pressure Cooker is the top rated among them. There are 18 smart programs to choose from. These are Meat, Poultry, Egg and Vegetable, Risotto, Oatmeal, White Rice, Multigrain, Beans and Chili, Broth, Curry and Soup, Cake, Sterilize, Canning, Saute, Steam, Slow Cook & Keep Warm. Every single one can be selected by its own button. A Delay timer button is there to start cooking up to 24 hours later. If you don’t want to use any of the presets, just select the manual function and set your own time and pressure level out of three. The cooking pot insert is made of stainless steel (18/10) with a 3-ply bottom and the interior is coated with a PTFE and PFOA free non-stick ceramic layer. It is UL and ULC certified with 8 safety mechanisms. This cooker lets you cook two dishes at once as it comes with a stainless steel rack that you use to set food above the food in the cooking pot. There is also a tempered glass lid included so that you can store leftovers in the cooking pot itself instead of transferring them to another container. This cooker comes up to pressure very quickly and if you need to release the pressure after cooking quickly, there is a feature for that. You can sear your meats nicely in the pot itself before switching to pressure cook or slow cook, so there’s absolutely no need to use any other pans. There are a few minor annoyances with this unit. You can’t decreases time if you accidentally go over your desired time setting. You can only increase it until it reaches its maximum and resets to the minimum. From there you go back up to your desired time setting. Each menu item can only be selected after pressing the Menu button. Otherwise, this multi cooker is a very good less expensive option than the Instant Pot Duo. Another direct competitor to the IP cookers is the COSORI 6 Qt Premium 8-in-1 Programmable Multi-Cooker. This is a third gen pressure cooker by the brand with 17 smart programs that you can use to Bake, Sauté, Brown, Boil, Steam, Slow Cook, and Pressure Cook. You have settings for brown rice, white rice, yogurt, vegetables, poultry, meat, multigrains, pasta, cakes, and more. In addition to being able to choose from presets you can also manually control the cooker by selecting from two manual modes with a choice of 6 different pressure levels and temperature adjustments in Fahrenheit or Celsius. You can set a delay timer for between 2 and 24 hours later. It comes with 10 safety mechanisms for even the most nervous cook. It has a quick release pressure mechanism for when you’re in a hurry. You get a stainless steel (18/8) inner pot with 3-ply bottom, a lid and steam rack as the essentials, but you also get an extra tempered glass lid for slow cooking and sauteing, an extra silicone sealing ring, a ladle, measuring cup and spoon. the bonus sealing ring is very useful if you want to separate strong smells from your mild dishes. Because silicone tends to retain smells, you can use one gasket for dishes using strong spices or garlic and the other one for milder smelling dishes. The bonus glass lid also increases the value of this cooker, as you can see through it when cooking non-pressurized dishes and can use it for storing leftovers in the fridge. Now we come to a multicooker whose biggest strength is low oil frying. If fried food is your thing but you want to reduce the amount of oil you use, then this low oil fryer and multicooker by De’Longhi is a good option, as it has a food capacity of 60oz and can cook or fry about 3.7 pounds of food at a time. It uses an innovative convection heating system that circulates hot air throughout the inner pot while mixing ingredients with an inner cooking paddle to fry, saute or roast foods without the need for much oil or you manually stirring. The paddle can be removed if you want to use the device for baking, broiling or grilling instead. All these happen in quick time and you can monitor the process if you want to through the transparent BPA-free lid. There is a power level dial and removable timer to allow you to control the whole cooking process. The inner cooking pot is made of aluminum and is ceramic coated for a non-stick & anti-scratch layer. The technology uses an upper heating element of 1200 watts and a lower element of 200 watts and you can choose from 4 temperature power levels, although you may feel that this limits you to only using the recipes provided for this cooker. However, it allows you to make rice, soups and stews, while also allowing for grilled or roasted meats and vegetables. The stirring paddle allows you to walk away from the unit without having to worry about food sticking to the bottom. While this appliance is powerful and well made, it is quite large and the fan is a bit noisy when the convection heating is on. You must also keep in mind that this can only be used to air fry dry frozen and fresh foods with little or no oil but not batter dipped food or doughnuts. Those items will need traditional deep fryers. However, most users say that these are only minor issues. You could also take a look at some less expensive low oil fryers that are not as good at the other cooking methods but still do a good job with just air frying. If you’re not really interested in pressure cooking but want all the other functions that a multi-cooker is known for, particularly frying, then the Gourmia GCR1700 10-in-1 Programmable Multi Cooker is a good option. Its USP here is that you don’t need to babysit a dish that needs constant stirring because it comes with its own robotic hands-free stirrer mounted on the top to stir the food that’s braising, sauteing or stir frying, like risotto, stews, fries, soup and scrambled eggs. This cooker can be used to grill, bake, steam rice, fish and veggies, saute, pan fry, stew, stir fry, slow cook, roast or make sauces all without the need for you to stir. It also features an auto circulating heat system that moves hot air through and around all the food so that you get moist and tender interiors and crispy exteriors. This is especially useful for making fries, chicken, steak and more. The preprogrammed control panel features an easy to read display for time and temperature that you can manually operate or let the cooker set according to your selected program. For a good slow cooker option that you can also use to brown meats very well or steam rice or veggies, the Cuisinart 4 in 1 multi cooker is your best bet. At 7 quarts it is large enough for a pot roast and the highest saute temperature is 500F, so you can brown or saute foods before switching to a high, medium or low temperature setting for slow cooking. You can also roast between 250 and 450F, or steam foods using the reversible rack. This was one of our top picks for a programmable slow cooker, so you can read our full review on the Cuisinart Cook Central here. This is a complicated appliance and so there’s always a possibility that a new unit may malfunction or come damaged in some way. To make sure that it’s not, do a test run with just water by following the directions in the manual precisely. First make sure that all the parts fit together properly, then make sure all valves and locking mechanisms are aligned/engaged and work. Make sure that the pressure release valve works. If anything seems off or obviously broken, return the unit and get a replacement. Most types of cooking in a multi function cooker will require at least some water. Steaming, slow cooking, pressure cooking all do. Only those methods that rely on oil, like sauteing, stir frying or air frying do not need water. Read the manual and follow recipes initially to make sure you’re adding enough. A common complaint that first time users have is that steam or water starts bubbling out of the sealed lid edges and the pressure valve once the cooker reaches a high enough pressure level. This is usually because it has been overfilled and there’s not enough room for the steam to expand before release. Most of the time it should only be filled up to about 2/3 full. If you’re cooking foods that expand a lot during cooking then aim for only half full. When cleaning the cooker you also have to clean the pressure valve if it was used. The opening has to be clear to allow steam to escape properly or cooking the next dish will be affected. Foods that sputter when cooked should not be pressure cooked but slow cooked. These include pasta, oatmeal and thick sauces. The default heavy lid is perfect for pressure cooking but it is heavy and you cannot see inside the pot for non-pressurized cooking. When doing frying and slow cooking, a normal glass lid is better. You can also use it to cover the pot if you want to store leftovers in the fridge without transferring the contents to another pot. When using the inner pot to cook the main dish, you can set a steam rack over it to steam some veggies or fish. This rack would sit over the water level. Most multi function cookers do come with one but if not, there are plenty of options to choose from.